30 Acts , One fabulous night of Wearable Art, Fashion, Music And Performance, unlike anything you may have seen before on the catwalk! Featuring 9 Local Fashion Houses, 15 Wearable Art Fashion Exhibitions, 5 Performance Acts, 4 Live Bands and Dj’s as well as 85 Artists and Models. Hundreds In Raffle and best D.I.Y Fashion Costume Prizes. Think Ecouterre Surrealista…dress up! 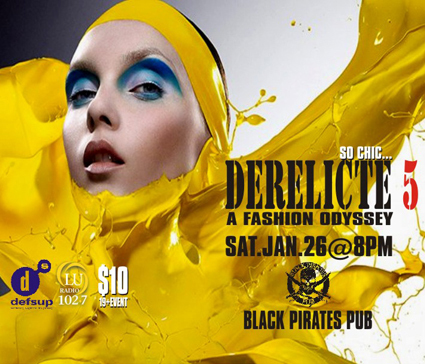 “Walk Off” Challenges -Catwalk Brawling-belly dancing With Dahab-Derelicte Dancers…so Haute Couture! – Paparazzi Moments-Fashion Assassin Drag Queen Performance W/paloma Marquez – Fashionista Dj Dance Party – 600 In attendance last year, advice come early…..What’s your Fashion Tribe?…This winter, be Haute! be Derelicte!